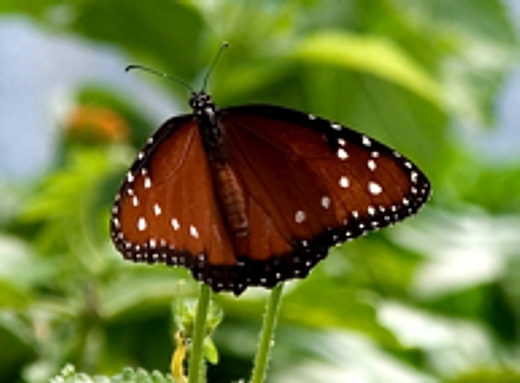 The Queen is a very large butterfly that is colored chocolate brown which has wings that are edged in black as well as a few white spots on its wings. Primary it is brown, so that the image that you get as you view it will be chocolate coloration. The Queen is a close relative of the Monarch butterfly, which is far more orange and much larger. The male queens have a black spot on the hind wings, while their caterpillar is very brightly banded with rows of lime, black and yellow. The Queen caterpillar looks almost exact to the Monarch caterpillar but has three pairs of antenna rather than just two. The chrysalis looks like an inch tall green pumpkin and hangs from cremaster on the host plant. Queens are common from the southerly parts of the US, into South American, generally in open areas, and are one of the most common butterflies living in the sonoran desert area. They can be seen on nearly any sunny day. Queens are only active if it is sunny and warm. On cooler mornings or days, you will see Queens basking in the sun waiting for their body temperature to reach a level for flight. Butterflies go through a cycle of life that is called a metamorphosis. This cycle begins with an egg, which hatches into a caterpillar that will follow a cycle where it eats, grows, and sheds its skin several times as it grows. The caterpillar then becomes a pupa or chrysalis from which the butterfly emerges. 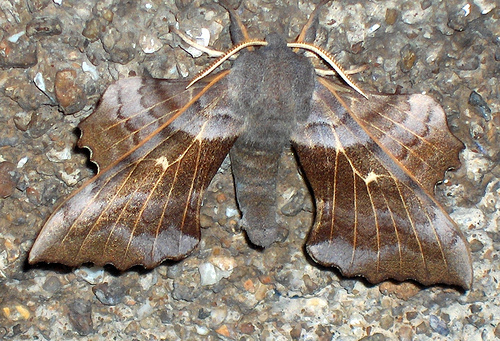 The adult butterfly sips nectar, mates and lays eggs, which completes its cycle. Many butterflies live just a few days or weeks. The Queen is unusual in that it may live over the winter to mate again in springtime, while the monarch may live one or two years, and will actually migrate several hundred or thousand miles to mate and spend the winter in a southern climate. The adult butterfly lives off the energy of the sugar that it sips from flowers, called nectar. Most butterflies need specific types of nectar. Some will eat only one thing or another as caterpillars. The queens love Mist flowers as well as milkweed and Queen caterpillar only feed on milkweed, Asclepias, and milkweed vine. 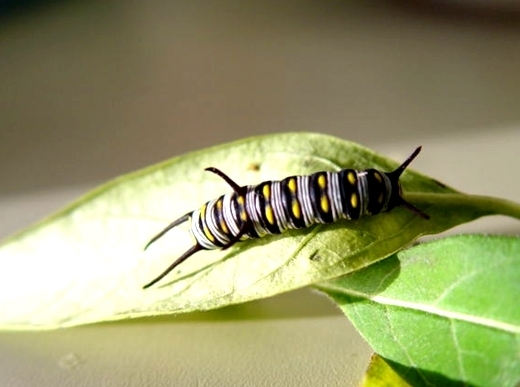 Milkweeds contain cardiac glycosides, a toxin that the caterpillar, and because of this trait the adult butterfly is toxic and any bird that eats one of the butterflies, Monarch or Queen is very quickly poisoned. The bird does not die, but gets very sick and vomits. So birds will learn to stay away from these kinds of butterflies. Interestingly, some other species of butterfly have evolved to mimic the color pattern of Queens and Monarchs. 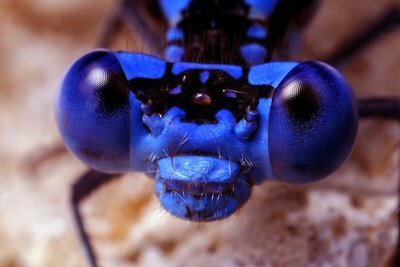 They benefit from the bird’s reluctance to capture Queens and Monarchs. 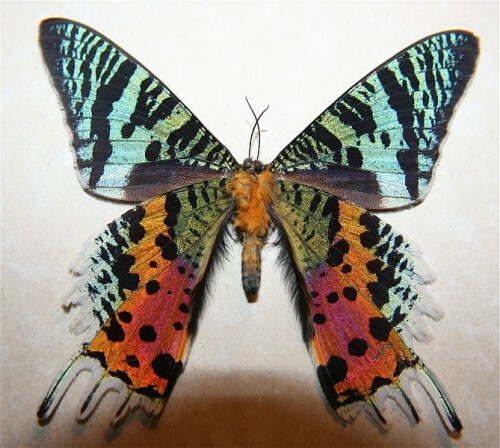 This is called Batesian mimicry.